We’re Ann Martin, Kathy Haynie, David Fetterman, and Kimberle Kelly, here at AEA365 to share a repository of resources for the evaluation of STEM education and training initiatives. Over the past two years, the STEM Education and Training TIG has been working with the Computer Science Impact Network (CSIN). CSIN grew out of efforts at Google, the National Center for Women and Information Technology (NCWIT), and the Computer Science Outcomes Networked Improvement Community, and is now a community of over 50 evaluators working in the field of computer science education and workforce development. CSIN has been an active partner with the STEM TIG in designing the repository and has contributed resources related to their CS interests. This bank of CS/STEM education evaluators have volunteered to assist repository users (and we encourage those of you reading this to help each other as well). The repository, though, also draws from the TIG’s broader connections to all disciplines in STEM education, including science, technology, engineering, mathematics, STEAM (STEM + arts), health and medical professions, and more. This resource points users to instruments, protocols, and scales, as well as reports/deliverables, resources for evaluation planning and capacity building, links to other useful repositories and collections, and information about communities of practice. In short, if you work in any corner of this field, this collection is for you! Rad Resource: We shared the latest version of the repository at Eval 2018, and we plan to continue our efforts to develop and grow this as a resource for all professionals interested in STEM education and evaluation. Our goal is to consolidate the knowledge that lives in professional networks of STEM evaluators and to help other evaluators find comprehensive resources. By working together across networks, we can strengthen our professional practice and increase access to high-quality STEM evaluation resources. We encourage AEA365 readers to check out the repository at http://orau.us/repository, and to scroll down further on that page to add resources! With your help, we can make the collection broader, stronger, and more useful for the STEM evaluation community. Add resources that you or your organization have developed, or submit a resource that you have found useful in your own practice. 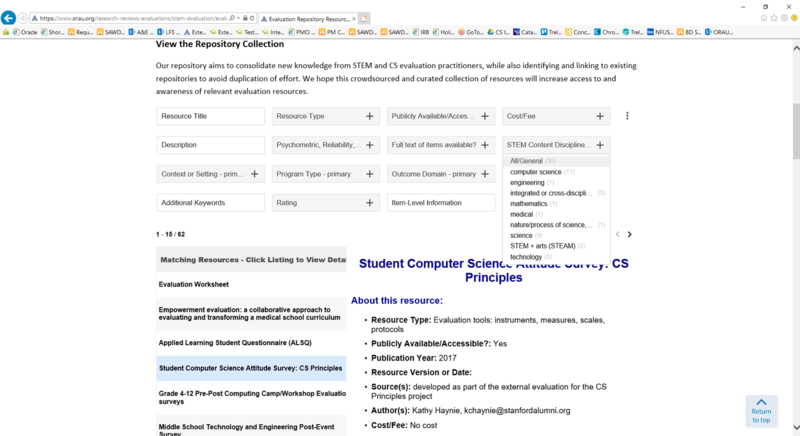 The collection form has options to assist you in entering and categorizing a range of resources and walks you through the data we need to make the repository simple to search and filter. Hot Tip: If you would like to get more involved behind the scenes with the repository, the TIG, or the CSIN initiative, please reach out to Ann Martin (ann.martin@orau.org) and Kathy Haynie (kchaynie@alumni.stanford.edu).